Machinery and Equipment (M&E) industry is one of the catalytic subsectors identified under the 11th Malaysia Plan to spur the country’s economic transformation to greater prosperity, due to its cross-cutting linkages with all economic segments such as the primary, manufacturing and services sectors. ・In this topic, the imports and exports of Machinery & Equipment is listed in details. The needs for high-technology M&E in these industries is the key to their survival within a global environment and will accordingly continue to grow in the future. 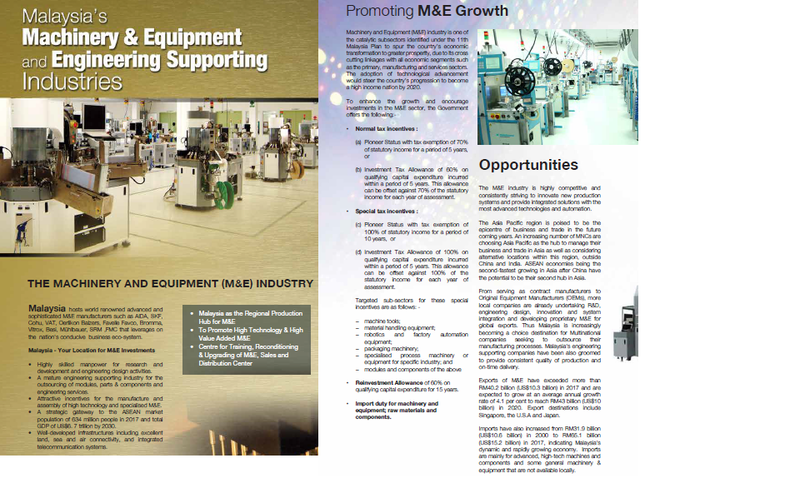 ・Malaysia's Machinery & Equipment manufacturing offers opportunities in four major sub-sectors. ・In this topic, the companies for the local and foreign Machinery & Equipment in Malayisia are listed and written in details. ・The engineering supporting industry in Malaysia has developed to be an important driving force for growth of not only the M&E industry, but also for every industry sector and there are eight sub-sectors for Engineering Supporting Industry.